• Prognosis is an important issue among patients who have psychotic features and a depressive syndrome; some have outcomes that suggest diagnostic revisions to schizophrenia, and this has far-reaching implications for treatment. To explore this issue, we used biannual evaluations to follow up 103 such individuals for 5 years. Patients with Research Diagnostic Criteria schizoaffective disorder experienced substantially more morbidity of various sorts than did patients with Research Diagnostic Criteria psychotic major depression. Within the group with schizoaffective disorder, patients with the chronic subtype experienced more morbidity than did those with nonchronic schizoaffective disorder; the mainly affective-mainly schizophrenic distinction had less prognostic significance. 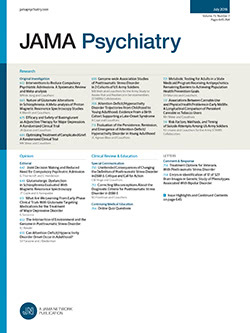 Factors that predicted sustained delusions at the end of follow-up were exclusively historical and suggested a poor-outcome prototype patient who is single, was socially impaired as an adolescent, and has a history of schizophrenialike psychotic features temporarily dissociated from affective symptoms.